Map here is java.util.Map. I put it there just to try some more common case. Generally it is a specific listener interface in my project. What I get as a result shown in the dialog are the classes that I would expect to see (implementing the interface). But also some other classes/interfaces. These extra classes/interfaces are not associated to the base class given (here Map) in any way that I see. For example, using the code above the dialog shows me a class in the project that extends nothing and implements nothing. In fact, it does not even import "java.util.Map" nor does it have the word "map" in the code anywhere. Am I doing something wrong with this? Also, I tried to set up a new plugin project to produce a bug report. My new plugin project keeps loading the old one (which I am actually developing). Is there some way I need to "reset" or clear the plugin development environment to load the environment for another plugin project? Could you provide a minimal but complete sample project which illustrates the problem and your plugin with instructions on how to use it? P.S. You can use this plugin for pasting colors-aware code into forum. I attached what you requested on that. Can you take a look and tell me what is wrong? Thanks for taking a look. I see it was my bad for not checking the inheritance tree. So I guess if you create the chooser with the inheritanceXXX factory method, it is not a real filter like it is if you attach one yourself (like in the "classes" tab)? I thought it should not show anything if nothing was there to show. Also, if I changed it to a Map interface it showed me a strange choice, which I still do not quite understand. Not that it matters as I do not really plan to look for Map implementations and I guess I can try to filter the unwanted inheritance tree by creating my own filter. The custom filtering seems slower but I guess I have to look into the indexing API or something. The stuff could be a bit better documented. I still have a similar issue but with the end condition chooser in the same project and with the same plugin. 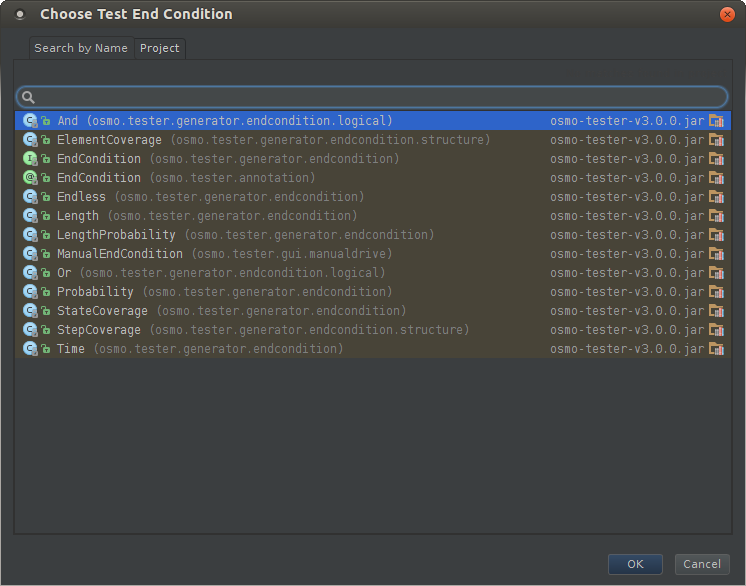 Click the "..." on the right of "Test endcondition". You get the right choices but there is also stuff like "And (com.sun.org.apache.xpath.internal.operations)". I do not know if this is because there is also "And (osmo.tester.generator.endcondition.logical)" which is and should be in the list. So, can you tell me what did I do wrong with that one? At least I can't see how the Apache code would inherit my custom class..
Btw, you can always debug the processing at local environment if the problem is stabily reproduced there. OK, I guess you have somehow a different environment when you run it. Why is annotation version shown? Because it has the same name as one of the valid ones?